Joe Henderson’s inclusion of the Cole Porter standard “Night and Day” on Inner Urge is something of an anomaly in his early discography as a leader. 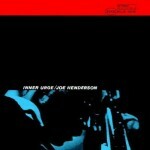 Henderson’s first recordings, Page One (1963), Our Thing (1963), In ‘n Out (1964), Inner Urge (1964), and Mode for Joe (1966), were released by Blue Note. Each of these five albums are comprised entirely of compositions by Henderson and his contemporaries Kenny Dorham, Duke Pearson, Cedar Walton, and Lee Morgan, with “Night and Day” the only standard. It wasn’t until Henderson’s first recording with the Milestone label, The Kicker (1967), that he would again record an American Songbook standard, “Without a Song” (for a look at Henderon’s reharmonization of “Without a Song,” see Ethan Iverson’s article at Do The Math). But in Henderson’s arrangement of “Night and Day,” he prepares this B♭maj7 chord with several different methods. 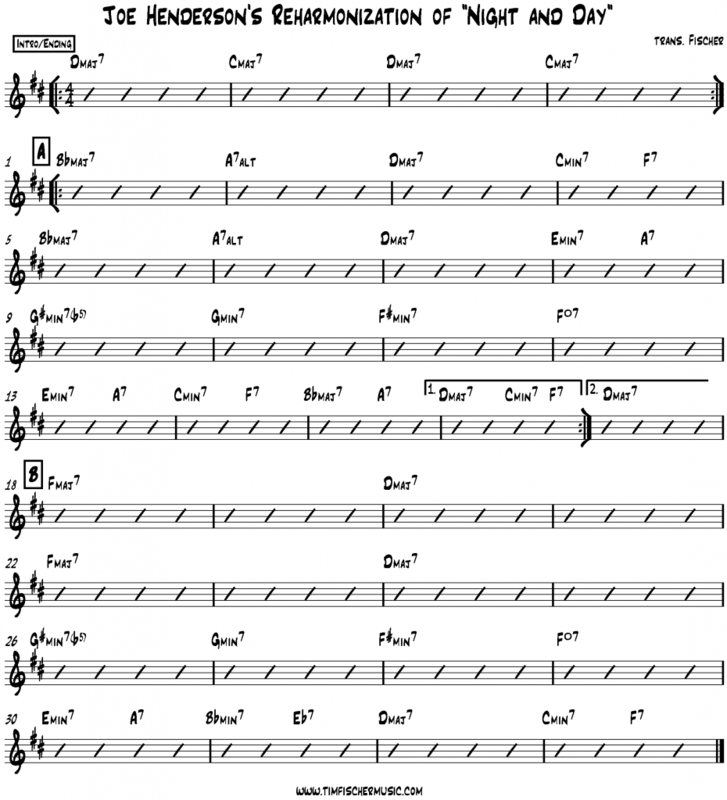 The chord is first heard when the band transitions from the introductory vamp to the beginning of the melody statement. The introductory vamp on its own is nothing remarkable — a I–♭VII repeating two-bar pattern (Dmaj7–Cmaj7). But, when the melody starts on the B♭maj7, we have a progression of three major seventh chords with roots descending in whole steps (Dmaj7–Cmaj7–B♭maj7). This whole step pattern slightly destabilizes the D as the key center, as well as representing an exact transposition and diminution of measures 5–16 on Henderson’s composition “Inner Urge,” recorded on the same album as “Night and Day.” In measures 5–16 of “Inner Urge,” Henderson has the same pattern of major 7 chords descending in whole steps (Fmaj7–E♭maj7–D♭maj7). Measures 5–8 in Porter’s original “Night and Day” harmonic progression simply repeat the first four bars, with the transition to B♭maj7 unprepared; Dmaj7 precedes the B♭maj7. The jump from Dmaj7 to B♭maj7 results in the note B♭ being the only chromatic tone in the home key of D major, once again portraying the B♭maj7 as a ♭VI (i.e. a borrowed chord firmly in the key of D major). But Henderson does not stay on the Dmaj7 in bar four of his arrangement. Instead, he inserts a one-bar ii-V in the key of Bb major to prepare the arrival of B♭maj7 (Cmin7–F7). 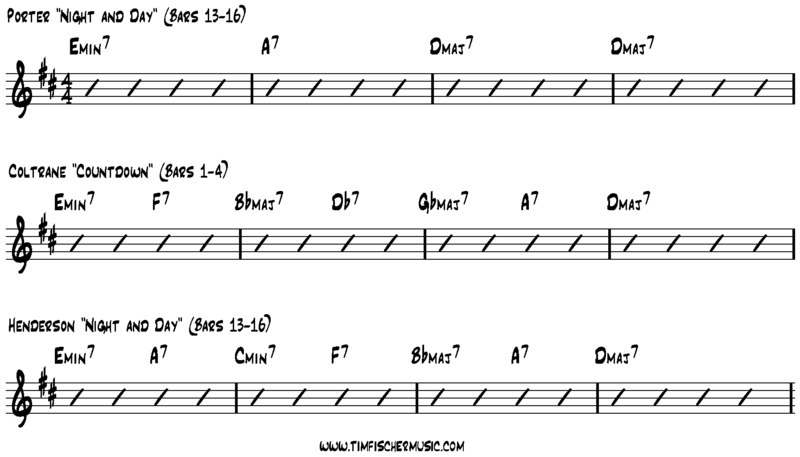 While inserting a ii–V may seem commonplace in jazz harmonic practice, the introduction of the note E♭ pulls as away from the key of D major and suggests B♭ major as a temporary tonic. 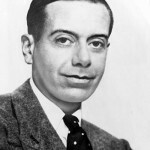 This exact harmonic progression occurs in the often-cited bridge to the Rodgers and Hart standard “Have You Met Miss Jones,” while the key relationship of major thirds is the same found in John Coltrane’s “Giant Steps.” Henderson does not introduce the third tonal center that Coltrane used on “Giant Steps,” “Countdown,” and other compositions from 1959 to 1961. But Henderson takes another cue from Coltrane’s “Countdown” and develops his own reharmonzation for a four-bar ii–V–I in bars. Below is the Porter’s original ii–V–I, Coltrane’s first four bars of “Countdown,” and Henderson’s two-tonal center reharmonization. Both Henderson and Coltrane delays the resolution to Dmaj7 from measure 3 to 4. But instead of moving to G♭maj7 like Coltrane, Henderson works within two-tonal centers by placing a two-beat ii7 chord in front of each V. In this way, Henderson shares Coltrane’s two-beats-per-chord harmonic rhythm, but extends the duration of the key centers. While Porter’s original harmonic scheme for the last eight measures of the B section is identical to the last eight measures of the A section, Henderson modifies the last four measures to arrive on the Dmaj7 in the penultimate bar. The difference between delaying the Dmaj7 at the end of the A sections but not delaying the resolutions at the end of the B section helps provide a stronger sense of cadence at the end of the form. Henderson once again uses the note B♭ as an important part of the resolution to D major, but chooses a different chord quality, instead employing the classic bebop-era tritone substitute ii–V (Emin7–A7–B♭min7–E♭7–Dmaj7). This lesson demonstrates melodic ideas that outline a ii–V a tritone away from the underlying harmonic progression. Transcription of Joe Henderson's solo on "Night and Day"